When I worked on the Antediluvian Timeline, I was fascinated. 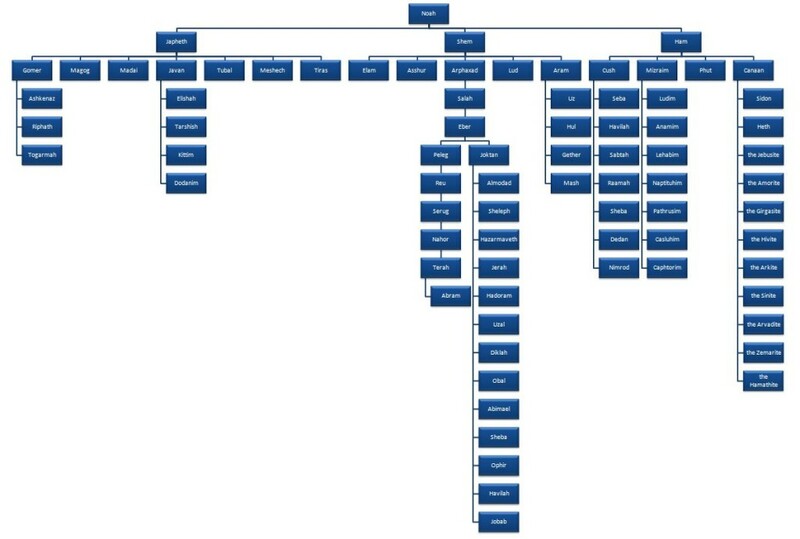 But when I worked on this Postdiluvian Timeline, I was… flabbergasted. I couldn’t believe my eyes! Needless to say, it completely changed the way I read Genesis and the stories in that book. So, I invite you to go through this with me – I think it’d be worth your time. There’s no easy way to communicate all of the fascinating points observed from this exercise, so I’ll do it in bullet points. I’d also add that with the postdiluvian timeline, there’s some caveat and uncertainties in the accounting, since the data are not as explicit as the antediluvian ones. I’ll go over these uncertainties in this post. And for references too, the bulk of the data is found in Genesis 11:10-26. I was fascinated to find out that 9 generations lived together for 56 years in the antediluvian period, but after the flood, there were 10 generations who lived together for 118 years! It was the sequence from Noah to Terah (Abram’s father), from year count 1878-1996. This happened because the age of humankind shortened after the flood, so while Noah and Shem still had the blessing of longevity, their offspring were starting to reproduce at younger ages. Thus, they saw more generations. Shem was still alive when Abram was born. Even greater yet, he was still alive when Isaac was born. Shem died when Isaac was 50 years old, some 10 years before Esau and Jacob were born, 10 years after Isaac married Rebecca. Shem saw 10 generations after him, although not all living at the same time. In Patriarchs and Prophets p. 125, it says “Adam, Seth, Enoch, Methuselah, Noah, Shem, in unbroken line, had preserved from age to age the precious revealings of His will. The son of Terah became the inheritor of this holy trust.” This is taken to imply that Abram was instructed by Shem personally. Imagine that, to hear of God’s grace and judgment from someone who went through the flood, who saw and experienced the ‘before’ and ‘after’ pictures. In Gen 10-11, it is recorded that the nations were divided after the flood. So, even though these generations lived at the same time, they might not live in the same places, although of course there are possibilities of them traveling and visiting each other, as probably what happened in the case of Abram and Shem. Everyone from Arphaxad to Isaac had direct interaction with at least one person who actually went through the flood. Everyone from Arphaxad to Terah could hear about the flood from Noah himself! This means that everyone who was born from right after the flood up until the days of Isaac was contemporary of the survivors of the flood. 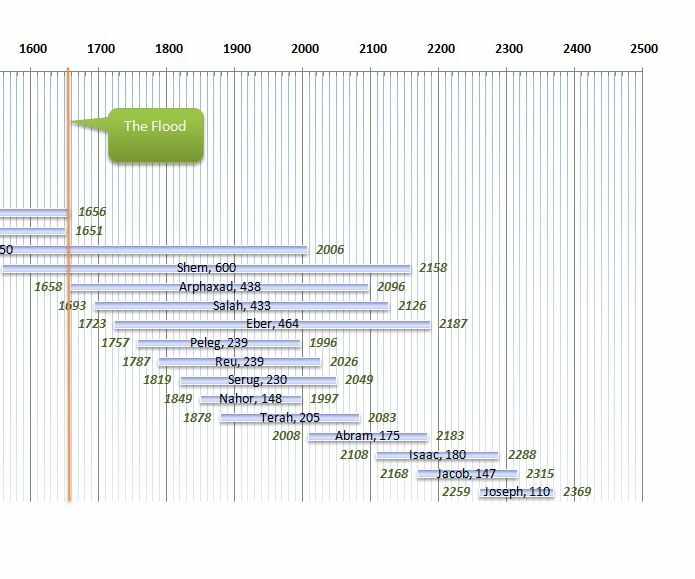 Imagine how ridiculous a skeptic would sound in those time periods who would deny the flood ever took place. Noah and Shem would be like, “Err..I was there.” It would be equivalent to a 21st century person saying that 9/11 didn’t happen. Basically for these people, the flood was not ancient history. Noah outlived Nahor (Abram’s grandfather) by 9 years. If you put the postdiluvian timeline side by side with the postdiluvian genealogy below (click on picture), you’ll see something else that’s amazing. In Gen 23 after Sarah died, Abraham went to the children of Heth to buy a piece of land for Sarah’s burial. Sarah died when she was 127 years old, i.e., when Isaac was 37 years old, 3 years before Isaac got married (year count 2145). Heth was Canaan’s son, Ham’s grandson, meaning that he was approximately contemporary of Salah, who was still alive during the time of Abram, but died before year count 2145. This means that it could very well be that when Abraham went to the children of Heth, Heth himself might still be alive, or even Caanan himself might still be alive. But what’s more likely is that Ham was still alive, since he also probably had a long life as Shem did. (Note: the descendants of Heth were called the Hittites – FYI; in Gen 26:34-35, Esau married two Hittite women and grieved his parents). I recommend using these figures when you read Genesis or even the rest of the Old Testament. It’s kinda cool to see the lineage of certain people and nations in Israel’s history. Now if you zoom out to see both the antediluvian and the postdiluvian timelines, you can count the degrees of separation between Adam to Abram. Adam could pass on his knowledge of God to Methuselah and Lamech, who had direct interactions with Shem for about 100 years. Shem, then passed it on to Abram, and possibly Isaac. Thus, there are only 3 degrees of separation between Adam and Abram. See why they didn’t need written records as much back then? Seeing this zoomed-out version makes me realize that there’s not that many degree of separation between these guys and Moses as well, since Moses lived around 200 years after Joseph’s time (my next timeline project). This means that the assumption that the Israelites forgot everything about the true God while they were enslaved in Egypt may not be true, since these things were not ancient history for them. In fact, it may very well be that they remembered a lot of it. As before, if you want the Excel file for these timelines, let me know and I can email it to you. There’s much more notes than what I can share in this blog entry, especially with the collection of the data. For example, the age of Terah when Abram was born is inferred from several Bible verses, so there’s some uncertainties there. The age of Jacob when Joseph was born also needed to be calculated from several time points given in multiple places in Genesis. I still have to type these out, but if you want them, I can send it to you as well. This is the second of the Genesis Timeline and Genealogies series. Read the first here.